WhoSampled presents ‘Samplethon’ – The global community for audio culture. 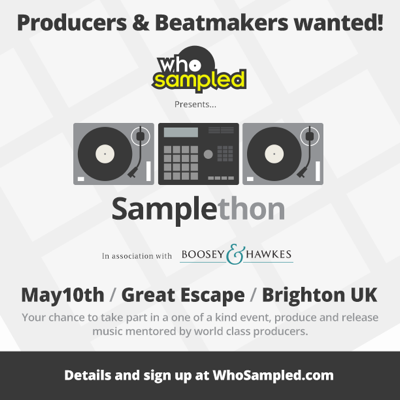 CALLING ALL PRODUCERS: COME BATTLE IT OUT AT THE WORLD’S FIRST EVER SAMPLETHON! On Saturday May 10th 2014 WhoSampled will host the first ‘Samplethon’ – the world’s first ever Hackathon for music! This first-of-a-kind event will give up-and-coming producers access to rare and sought after sample material from a leading music library to produce exciting new music under the guidance of world class producers. During this one day event hosted at the Great Escape Festival in Brighton, UK, 20 producers will be given exclusive access to pre-cleared original sample material from the archives of famed library music specialists Boosey & Hawkes. The challenge: to produce a new track using the provided sample material against the clock, with the supervision and assistance of our team of esteemed mentors. This is a rare opportunity to sample from these highly regarded recordings performed by world class musicians, free from the legal shackles often associated with sampling. The day will conclude with a judging session where industry experts will choose the winning tracks which will be put forward for inclusion on a forthcoming release alongside tracks created by established producers, all to go on to form part of the prestigious Boosey & Hawkes music library. We are looking for 20 talented producers to take part in this event. If you are a producer or beatmaker interested in battling it out at this unique event with an opportunity to win prizes and put your music in front of the world’s largest community of sample based music fans, we want to hear from you! Further details will be announced in the coming weeks so stay tuned to our blog, Facebook and Twitter for more info!